Wood fireplaces are among the oldest designs, but they still remain popular in contemporary architecture. Fireplaces were exclusively set up to serve a functional purpose. As new designs were constructed, heating systems were not only meant to warm up the room but also add aesthetic value to the interior design of living spaces. The use of gas and electricity saw smaller designs develop and wood burning stoves employed modern technology that simplified the heater’s design. Fireplaces have since taken centre stage when it comes to interior design. In Australia, fireplaces are popularly installed in living rooms. Over recent years, these installations have found their way to bedrooms especially master suites. With the increasing demand for fireplaces for master suites, it is crucial to find out which fireplace is ideal for a bedroom. Old is gold and wood fireplaces have stood the test of time to be one of the leading heating options for bedrooms. Although woof fireplaces are popular in living rooms, modern designs have proved to be equally as good for bedrooms. Inbuilt wood fireplaces offer a good heating solution for master suites and other bedrooms. These fireplaces do not occupy too much space since they are built into the wall. Moreover, most designs tend to be compact like the Heat Charm I600 Series 7 Inbuilt Wood Fireplace. Despite the design, these inbuilt fireplaces still give out enough heat to keep your bedroom cozy. If your master suite is spacious and you have room for big designs, the options are endless. One of the most lavish wood fireplaces in the market is the Bordelet Tatiana 997 Suspended Wood Fireplace. This is a French handmade fireplace design that is dramatically suspended from the ceiling to enhance the ambience of any room. It comes in an array of colours and its build is sure to be the centre stage of your bedroom. Gas fireplaces are a modern heating option. They are clean and efficient. With just a simple flick of a switch, you can turn your room into a cosy suite. Gas fireplaces come in an array of designs. Freestanding fireplaces and inbuilt gas fireplaces are among the most popular designs. If your fireplace is set up in the middle of the room you can opt for a double sided gas fireplace but if you are going to a lavish design, choose a linear gas fireplace. The LopiProBuilder range is the latest member of the Lopi Gas Fireplace range. The LopiProBuilder range offers an affordable entry-level range of linear fireplaces without compromising on the famous Lopi quality. Gas fireplaces are wonderful for making any room toasty warm without the added effort that a wood fire brings. To adjust the temperature in your room all you need to do is turn the dial on your gas fireplace. These fireplaces maintain the temperatures up while keeping the heating bills down. Ethanol Fireplaces are modern heating solutions that have become popular over the recent years. These fireplaces are not quite like your regular gas or wood burning heater. If gas and wood burning options have not met your needs, then ethanol fireplaces may be the option you have been looking for. Ethanol fireplaces are great in that they don’t require a chimney. You don’t need to worry about a cumbersome installation or tasking redesigning expedition in your home. Setting up an ethanol fireplace is as simple as mounting it in place. 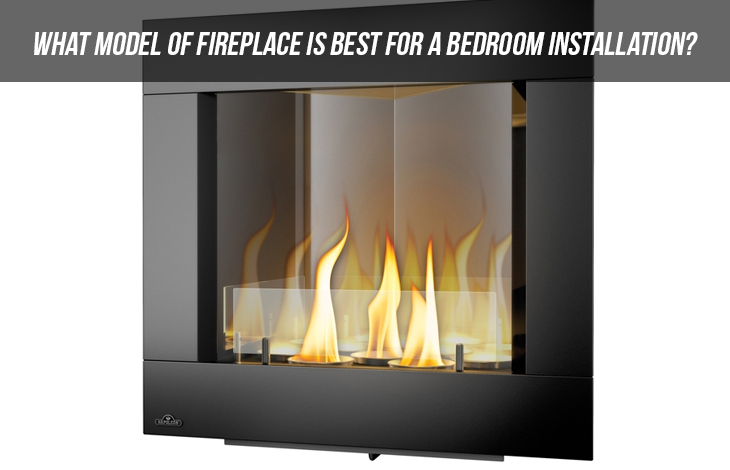 Ethanol fireplaces burn clean, without any gas or fumes, making them a very safe option for your bedroom. You don’t have to sacrifice style to own an ethanol heater. They come in a wide variety of models that look just like a real fireplace. Icon Nero 1450 Wall Fire mimics linear fireplaces and is a good option for a master suite or any bedroom. The Cocoon Aeris Black Bio-Ethanol Fireplace is a futuristic design that can be suspended from the ceiling or set up on a stand. It is a brilliant addition to any bedroom design. If you are looking for a portable fireplace option that can keep your bedroom warm, electric fireplace is your best bet. With an electric fireplace, you don’t need to install gas outlets in your home. Not only are electric fireplaces super handy to have around the house they can also look exactly like an inbuilt fireplace. There are designs that can sit level against any wall and look like a real fireplace jutting out of your brickwork. Dimplex and Gazco are some of the big names when it comes to electric fireplaces. Their designs are unique and suitable for any bedroom. A wide range of fireplaces is available for master suites and other bedrooms. So get a fireplace and keep your bedroom cosy.